The technology evolution has given birth to the new era of text information management that makes typing services increasingly popular these days. Many specialized companies and freelancers are fighting for the right to assist the potential customer with data transferring and typing. Whether you need help with typing an essay online or your resume, the price corridor in this area is considerably wide, but there are several factors that will inevitably affect the total cost that you might never have a guess about. What Features Will Determine the Final Paycheck? In fact, a typing work can’t be performed by any person who can type fast, on the first sight there are no special skills the typer needs for producing a document copy. However, if the information source is a lo-fi quality, the video performed in foreign language, with lots of specifications and abbreviations your circle of options narrows. Source type: Printed or handwritten. Payment for typing from non-electronic source will cost you much higher as it demands the work to be performed manually, using books or other material documents, that mostly can’t be done with a help of OCR technologies. Also, if the information should be derived from video or audio file that needs additional time and will reflect on charges for typing services. Source quality: If the source is of poor quality or very old it demands additional decrypting abilities from author so this significantly increases the typing services prices. Language: The average cost will be one-third or even half time more expensive in a different language. Completion: The rate can climb up depending on the urgency. Volume: The cost will depend on total number of pages typed. Specialization: It’s not a piece of cake to deal with specialized industry abbreviations or jargon, appearing in narrowly specialized fields, including medical and technical subjects. Even taking into account all the criteria listed above, the pricing may significantly vary from place to place, since there are factors such as experience of the institution that will impact the resulting sum. Officially employed in the typing industry, typing professionals are defined as secretaries and administrative assistants and get the salary of no less than $17.55 per hour. It might be a perfect variant for employers, who have the constant need in information flow to be obtained. In terms of freelancers, they are usually paid per page, word or hour too. Freelancers do have their own writing standards however. The leveling of prices will take place when the job will be done using standard rates, that exclude editing the document. 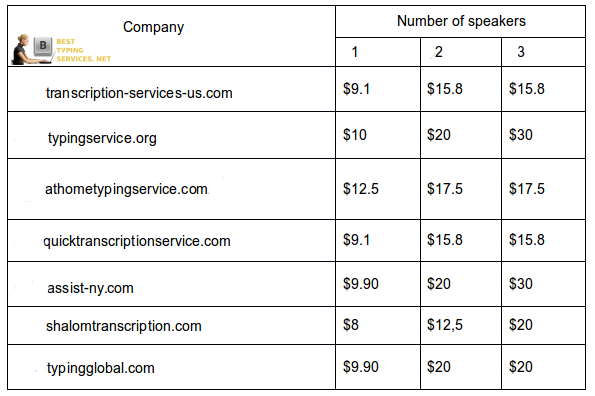 Typing services cost per page for many freelancers will be $3-5, and they will offer you to buy a special pack along with editing for 2$ per page. 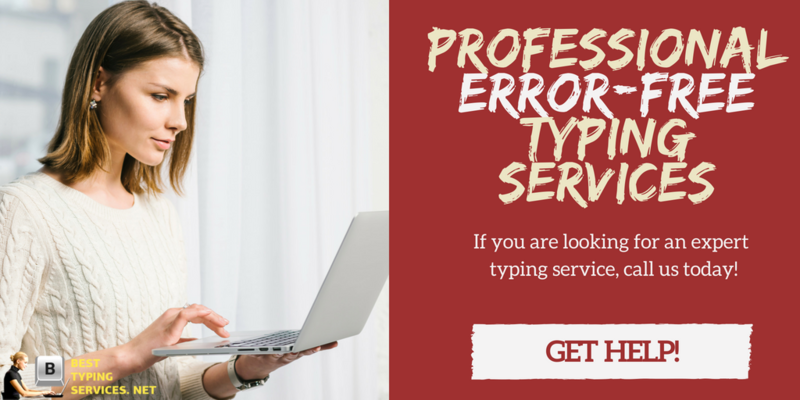 The hourly rate for typing services is just an easier way to figure out the equivalent for the going rate for typing services, made for employers, who only used to deal with in-stuff employees. Keep in mind, cost of typing services in companies is different due to policies and standards of work, for instance, in some places you will be charged 5% of transaction fee and in others the minimum order starts from $30 or 50$, depending on company. The legal transcriptions as a rule will cost you 25 – 50 cents more than average ones. Flexibility to change the standards and demands considering texts. Only for the long-term projects. Additional expenses, paid sick leaves taxes and vacations. Where to find: freelance portals, specialized sites, forums. Nobody knows how to find a 100% professional designer based on portfolio solely. Like in the lottery, the odds are unknown whether you get a good quality work, as freelancer works independently, there’s no department to proofread and correct mistakes. There’s no supervision, so the deadlines are often not met. Even top-notch specialists can fall within possibility of force majeure. Professional teamwork and proper standards of work guarantee your order gets processed on the highest level. Superior quality grammar (editing and proofreading stuff in the team). Quality takes the toll on terms and cost compared to freelance. Obviously, when you need to transcribe M4A to text, prices for typing services may vary, now then you’re equipped fully with all the information you can decide for yourself where the rates for typing services and their conditions are the most suitable for you. Make sure you don’t compromise the writing quality. 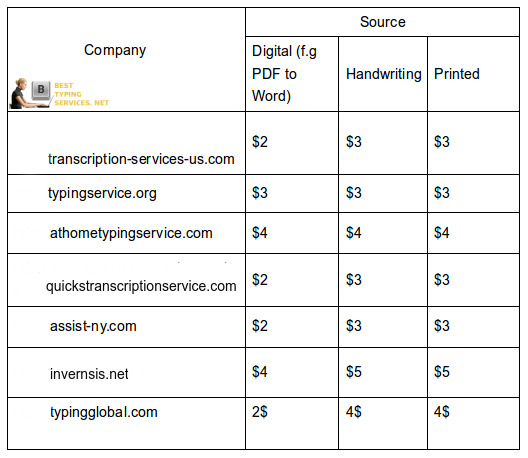 Check our typing services with cost per page and see the results!